Helen Janiszewski's research uses the seismic structure of the Earth's crust and mantle, particularly in subduction zones, to better understand the underlying tectonic processes. Picture by Roberto Molar Candanosa, DTM. 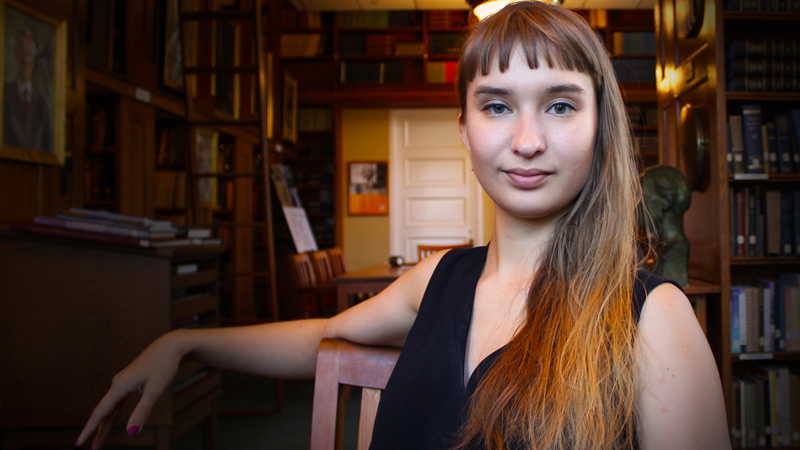 As a graduate student at Columbia University, Helen Janiszewski thought she could be someone who studies subduction zones, plate boundaries where oceanic crust crashes into continental crust to then sink into Earth's mantle. Sitting in the Abelson Building library at Carnegie's Broad Branch Road Campus, Janiszewski asks why "subduction scientist" isn't as good of a descriptor as "seismologist." That's precisely what she is striving to be as part of DTM's geophysics team: a scientist at the forefront of subduction zone research. 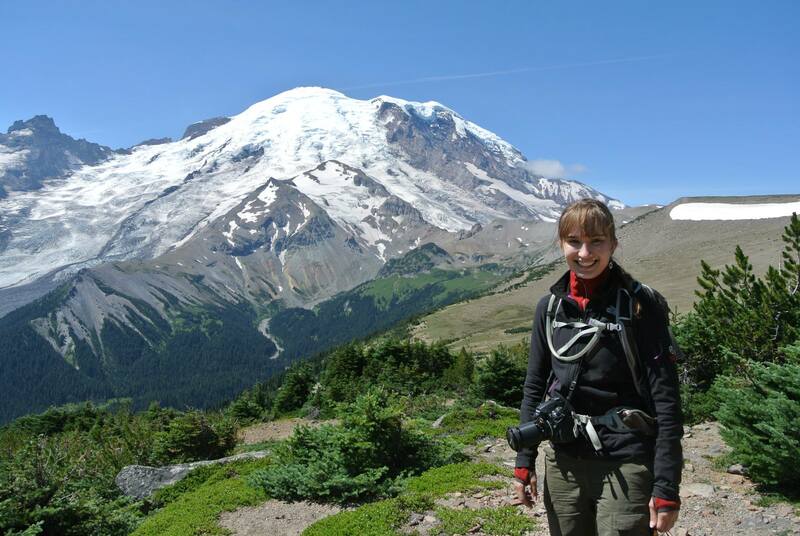 In this postdoc spotlight, Janiszewski discusses her time at DTM, a first-of-a-kind community experiment, and what she envisions for the field of seismology. DTM: What exactly do you do as a seismologist? HJ: I use seismic imaging tools to better understand subduction zones, and in particular I look at Cascadia off the northwest coast of the United States, as well as Alaska. Subduction zones are places where a lot of major earthquakes happen. There are also volcanoes associated with subduction zones. The images that I calculate from seismic data allow us to better understand the structures and geometries present there and hopefully to better understand how plate tectonic forces can influence large magnitude earthquakes and volcanic eruptions. How did you get into seismology? I loved Earth science since I was three years old. I was obsessed with dinosaurs and still am. That's why I still have them in my office. That comes somewhat from family. I grew up right outside New York City, and we were always going to the American Museum of Natural History. I loved seeing the dinosaurs there. As I got older, I got really into math and physics and knew I wanted to do something quantitative. I sort of loved problem solving. My dad has a Ph.D. in physics and my mom has a master's in math, so that's also an influence. From my first research project as an undergrad, I remember one of the overarching questions, and still a question I'm interested today, that motivated the project was: Why do we have continents on Earth, and where do they come from? I was doing a very small project related to that question. It was something I just never thought of before. Why do we have continents? I got hooked on those types of questions that delve into why the Earth is the way it is. What are these seismic imaging tools you are talking about? Seismic waves are waves that propagate through the Earth. They can be generated by earthquakes or large explosions, such as atomic bomb explosions, or sources like ocean waves that produce what we would typically call "seismic ambient noise." We can record all of those signals using seismometers, which are just basically telling us how the Earth is responding to these forces. By looking at the waves and using different types of processing techniques, we can tease out information about the velocities inside the Earth and how those waves are propagating. All of this tells us about the material properties of the Earth, such as temperatures, types of rocks down there, whether there's water or melt in the rocks, and things like that. 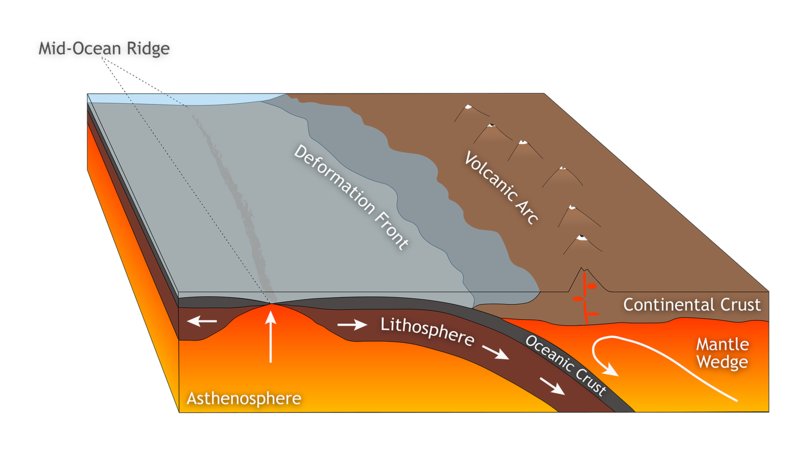 Schematic representation showing a subduction zone, a plate boundary where oceanic crust slides under continental crust. Credit: Roberto Molar Candanosa, DTM. Why do you study subduction zones? Subduction zones are just fascinating. They are one of the major tectonic regimes on the Earth—one of the major driving forces of plate tectonics—so there's the aspect of understanding what structures cause the variety of behavior that we see in plate tectonics and why plates behave the way they do in a particular location. There's also the aspect of understanding hazards associated with earthquakes and volcanoes. For me in particular, one of the reasons why this field is so interesting right now is that we have recently started deploying seismometers in large arrays offshore. People have been studying subduction for decades, but these types of larger-scale regional-resolution arrays have only started to happen in the last five to 10 years. Before, we were seeing only half of the structures in subduction zones, because we were only using seismic instruments onshore near subduction zones. Then, all of a sudden, with better resolution than we had before, we are able to see the other half of the system. So, it's a really exciting time because there's plenty of ideas and theories about what parts of the system govern subduction behavior, and now we are getting to revisit all of those ideas with a whole new set of data that we didn't have before. It's eye-opening. One of the main questions in my research is that although we know large subduction earthquakes are complicated, we don't know why. We don't know why sometimes we get a magnitude 9 and it ruptures this really large area, whereas sometimes it's a smaller one, maybe magnitude 8. We know that the variety exists, but we don't know what structures are present along that area causing this variety. So, what I'm trying to do is to better image those structures. Now, that in itself is not going to give us the answers for how they influence earthquake behavior. But if we have better images of what those structures look like, we can then start relating them to these other datasets that we have on earthquakes and hopefully better understand the relationships between them. What do these arrays look like? Seismic array refers to a type of experiment where you would install seismic stations at some regular spacing, in a grid on top of the Earth, usually within a particular region. The experiment I'm using consists of stations located at about 70 kilometers from each other. On the oceanic side, teams go out there on ships and drop these seismometers into the water. The instruments sink to the ocean floor, where they operate for a year or so before they are collected by another ship. 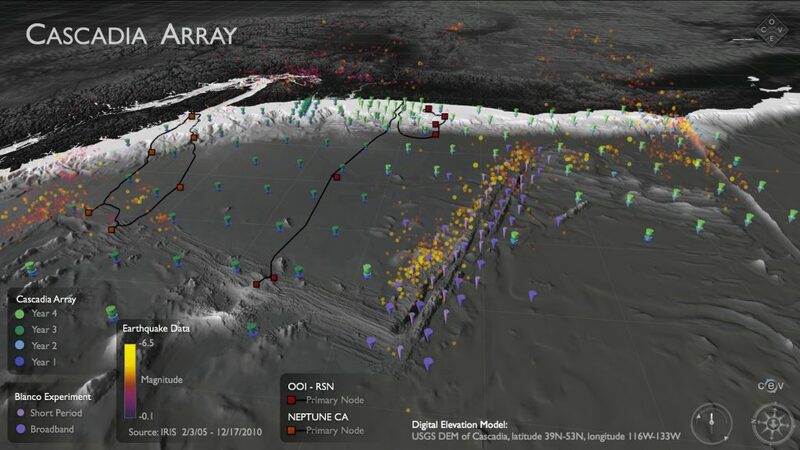 The Cascadia Initiative, an onshore/offshore seismic and geodetic community experiment focuses on questions ranging from megathrust earthquakes to volcanic arc structure to the formation, deformation, and hydration of the Juan De Fuca and Gorda plates. Credit: NEPTUNE-US Program at the University of Washington and the Center for Environmental Visualization. What have you been up to as a DTM postoc? The Cascadia experiment is a community experiment, and the offshore-onshore experiment is a type of project that hasn't been done before at the scale of an entire plate. It's a challenging dataset to work with. It was the focus of my Ph.D. research, but it's one of those things where you make some progress and then realize that there are a lot of other issues that need to be addressed. So for example, in seismology often there's different scales people work at. You might have someone who uses data that really just get at the upper 10 km of the Earth, and then you might have someone who's assuming something about the upper 10 km but their research focuses on 20 to 100 km. Then, you can have another type of analysis that assumes something about the upper 70 km and goes from 70 to 300 km. Working on techniques to bridge these is important. On that theme, I've also been working on more detailed seismic imaging underneath individual volcanoes. This research is still in subduction zones, but at a totally different scale. For example, I'm trying to image more detailed structure of the magmatic architecture under Cleveland volcano in the Aleutians, particularly in the mid to lower crust. That's part of a project that DTM staff scientist Diana Roman is leading, and a super interesting project that I've been able to get involved in. Say that you do everything that you want to accomplish in your career. How would that contribute to your field? Say we have a subduction zone. You have a plate coming in, diving under another plate. We have observations of what the plate looks like before and throughout subduction. In my career I hope that one day we can say: "Okay, we know that the structure in this area is different, and it's going to influence earthquakes in this way." Or, "we know this anomalous feature means that volcanoes associated with the subduction zone in this area are going to be different in this particular way." That's certainly not something I would be able to accomplish alone in my career, but it's what I hope to see the community as a whole work towards over the course of my career. How did you get to DTM? One of the things that was really nice about Columbia and the Lamont-Doherty Earth Observatory, where I did my Ph.D., was that it was just a huge research institution. The seismology and geophysics group probably had between six and 10 Ph.D. students the entire time I was there, in addition to professors, postdocs, and research scientists. So, inevitably there were always older students to ask for advice, one of whom applied to many postdoc opportunities, including here at DTM. I also knew of some of the scientists here, and when I got to meet some of the people at DTM, like Lara Wagner, Diana Roman, and Peter van Keken, it just seemed an absolutely wonderful place for me. I feel like I have a lot of freedom here in what I get to explore. People here encourage us as postdocs to think broadly and big, not just think about the here and now, but also where I hope to be in five years and how what I do now fits in that path. It's really nice to be in a place that encourages that mentality—it's very healthy. Helen Janiszewski focuses on using receiver functions, active source reflections, and surface wave tomography to image the Moho, the subducting plate interface, magmatic structures beneath volcanoes, and broader lithospheric structure. Photo courtesy Helen Janiszewski. How do you think your field is going to change in 100 years? Seismology and a lot of geology is interesting because it is a very young field. Plate tectonics is only 50 years old, and a lot of the types of seismic analysis that I use are even younger. That being said, we could put seismometers all over the globe, but we're only going to have so much data when it comes to studying tectonic processes that can take hundreds of years to repeat, such as major earthquakes or volcanic eruptions at a particular location. So, even in 100 years there will be a lot of gaps in terms of the natural events we can observe. But all of this is exciting because there's so much potential for us to observe earthquakes and eruptions and things that don't fit the theories that we have. And that means every time they happen, we have to go back and revisit what we know. Even in 100 years, that probably won't be settled. Also, I use offshore instrumentation, so I definitely want to see more of that. Oceans are one of the least studied areas with seismic imaging research, just because it's so expensive. There's so much we're starting to learn by the large-scale experiments that we have had in the last 10 or so years. Also in that line, the experiment I use data from is a community experiment called the Cascadia Initiative Experiment. It was proposed by the community, and the data is open to the entire community. Offshore seismology is traditionally a smaller community, so one of the goals was to broaden that group, particularly outside of traditionally marine-focused institutions. So I hope that in 100 years the offshore seismic community is larger and institutionally more diverse than it is today. In your opinion, what makes for an exemplary scientist? People who put time and effort into fostering the larger scientific community as well as focusing on their own research, whether this includes teaching, mentoring, or creating opportunities for others. I was always impressed by the scientists who not only had made giant discoveries during the course of their career, but that still talked with the students at social events, came to our presentations, invited us over for a group dinner. These scientists stick out to me because it isn't just about what makes you good at research individually and with your collaborators, but what you are doing to make the scientific community better and accepting of more people. That's really important to me.